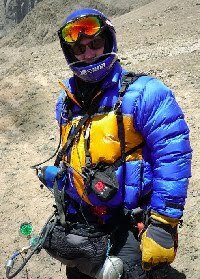 Colin Hawke's personal paragliding blog. 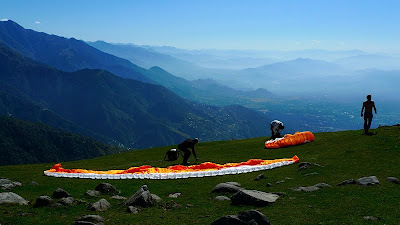 Bir is a village set on a plateau above the Kangra valley in the state of Himachal Pradesh in north India. 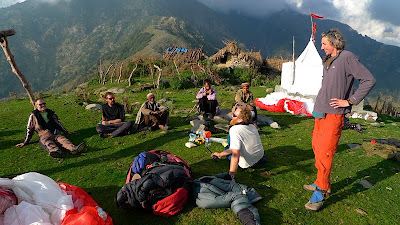 It's a friendly place full of rural Indians, Tibetan refugees and a surprisingly large number of paraglider pilots from all corners of the globe. 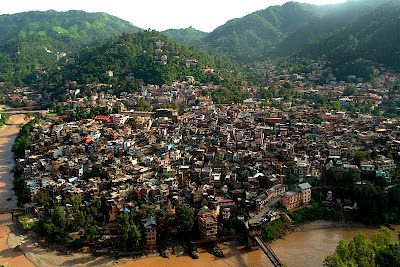 The reason for its popularity is the Dhauladhar mountain range, part of the southern Himalayan chain. Many spurs run down from this range and on one of these the Tibetan government-in-exile is headquartered in McLeod Ganj above Dharamsala. 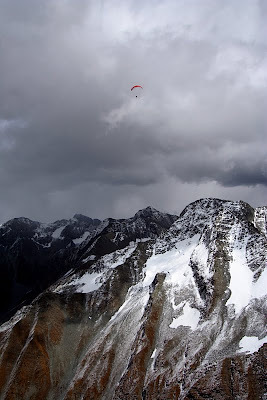 The main paraglider launch site of Billing sits on another spur and from which classic flying in spectacular surroundings can be made, either on the front ridge, or over the back in the more serious mountains. It's been on my paragliding wish list for some time and so I finally went on a trip in October, and what a trip it was! 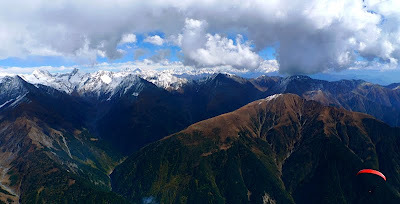 It started off with a 10 day guided tour with Jim Mallinson, Eddie Colfox and John Silvester aka the Himalayan Sky Safari boys but I ended up staying on my own for an extended month long flying adventure. I'll start with an account of the guided trip and then describe some of the classic flights in the area that I managed to do (sometimes several times) with lots of pictures and a few track logs. No doubt it will be a long post but it should give you a flavour of the place and hopefully persuade one or two pilots who haven't been there yet to go and taste it for themselves. 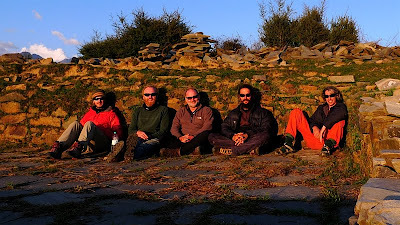 The Himalayan Sky Safari Guided Trip. First off I think I should start with answering a question I've recently been asked several times by fellow pilots - "Why take a guided trip if you are an experienced pilot already, can't you just go on your own to Bir?" Of course you can! But remember this is India with all its quirks and consequences. If you can afford it then it makes some sense to take a guided trip on your first outing there. You hit the ground running; acommodation, food and local travel are all taken care of. Being relieved from any organisational burdens gives you more time to actually enjoy your hard earned holiday. More importantly you have at hand the people with a wealth of local knowledge and experience of the area you'll be flying in. If you are a cautious pilot (which is no bad thing) being guided will likely give you better flying experiences, as on your own you'll likely be too conservative for the conditions on the day. Finally, the safety advantages are obvious, especially as Himachel Pradesh doesn't have rescue facilites to haul you off the mountain like you have back home in Europe or the US. Having an accident in the mountains of India can have big consequences as some unfortunate Russians have recently found out. The motley crew. Darwin, Eddie, me, Jim and John (Bruce absent). Back to business then, what did I do with those guided days? I must have been doing OK on the evaluation day as Jim took me 'over the back' on the first real flying day. What a great day it turned out to be as we ended up flying a 102km flat triangle in 4 hours 45 minutes at heights close to 5000m. Thanks Jim! See here for the track log. The route took us initially over the back of the front ridge in to the bigger mountains and then towards Dharamsala the 'high way'. From there we went back to Bir along the front ridge jumping from spur to spur. Jim from my perspective, can you see him? This was a nice day with all of us - that's Darwin, Bruce, John, Eddie, Jim and myself all flying together as a group. I'll explain this route in detail in a following section as it's a classic and probably one of my favourite flights in the area (in fact I did it a couple more times on my own). I had prepared for the expected (and any unexpected) nights out by obtaining light weight bivouac gear: specifically a sleeping mat, bag, bivvy sack and even a very light weight wood burning stove(!) that all neatly fitted inside my harness. Needless to say I was keen to try it all out. So we all took off and flew 30km west towards a ridge nicknamed Hobbiton by Jim and Eddie, this was due to a collection of small shepherds huts suitable apparently for Hobbits. The ridge, a perfect thermal trigger, was pumping as usual and top landing was pretty tricky. It took me quite a few attempts before I finally got the glider down safely. Eventually all of us landed but Bruce had a slightly harder landing than most ... Several shepherds saw us arrive and joined us for a cup of tea made on my new wood burning stove I might add! Then our fluent Hindi speaker Jim had a conversation with the Shepherds who asked to use our satellite phone to order new provisions, lucky them! We collected wood and spring water and set about making a fire and putting on the dinner, oh and multiple brews as the English do. Whisky was supplied by Bruce and John Silvester showed off his camp fire culinary skills. A great night out, enjoyed unanimously by everyone. 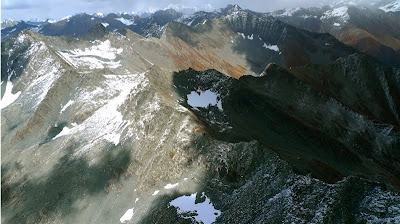 The next morning we launched and flew almost 50km east to Camp360 and did it all again. But this time in luxury as the camp was prepared by the Colonel and his staff providing us with a great evening meal and comfortable tents to sleep in. Quite a few other pilots flew in for the party as well. The next morning we flew back to Bir for a well earned shower at the Colonel's place. That was pretty much the end of the guided trip. A fantastic effort was put in by John, Jim and Eddie to make it a very enjoyable holiday. The following section just details several what I like to call classic flights that I managed during the couple of weeks following the tour. This is a classic flight that can be completed almost any day during the flying season. It's not easy however, you have to fly fast as the autumn day starts around midday and is essentially over by 4pm. I managed to do this flight a couple of times on my own and both times I only just made it back ... One of these flights can be seen here. There really isn't anything special you do on this flight, you just jump from spur to spur obviously using the eastern faces more on the way out and the western faces more on the way back. You save time by climbing as fast as you can and only climbing enough to get to the next spur and the next climb. 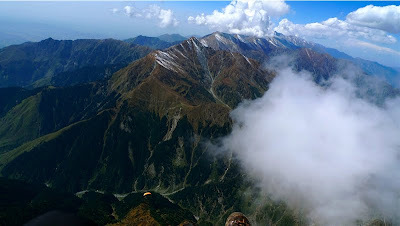 The recognised turn point seems to be just past the slate quarries on a ridge above McLeod Ganj called Triund. You can see the spurs running right to left off the main ridge. 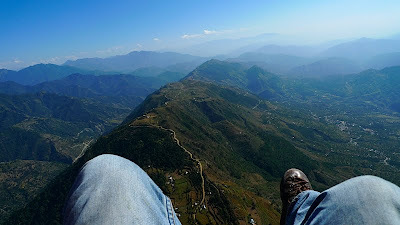 I've already hinted at this before but I really enjoyed the original flight to Mandi we did on the tour so much that I flew it a couple more times on my own. 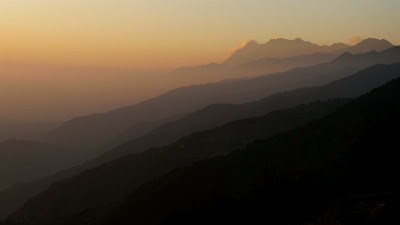 The ridge gently drops over 1km in altitude over its length and gets noticeably flatter towards Mandi. What makes this flight so special is you really don't have to thermal that much and you spend most of the flight just skimming along the top of a ridge waving at the people working in the fields or shouting Namaste to kids playing in their back yards. You really are connected to the ground on this flight, really special. Unusually high above the ridge to Mandi - it's much better lower. The final 15km is a little more stressful as the landing options are few and far between and don't forget about the wires, they're everywhere. So you need to keep a keen lookout if you're unlucky enough to be getting low. One of my track logs can be found here. 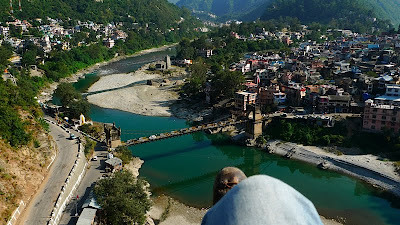 Flying over Victoria bridge to land on a beach near the burning ghats and temple. I've known about and heard about this flight for some time, it's a committing flight through the big mountains 'over the back' northwards to the buzzing town of Manali. I managed to do it this year with Tom and Scott, a couple of Scottish pilots staying at the Colonel's. Heading towards Danesar and onwards to Manali. 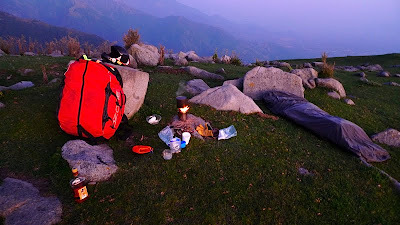 I talked over the route with John Silvester before I attempted it and what became obvious is that you just pick your own route through the mountains to connect with the Kullu valley as late as possible - the exact route depends on the height of the cloudbase and what mountain cols you can get over. As it turns out we had 'only' a 4800m base and had to skirt around Danesar and its lake. Near there Scott and I got separated (he missed a climb I took) and Tom was 30 minutes or so behind us so I was on my own. 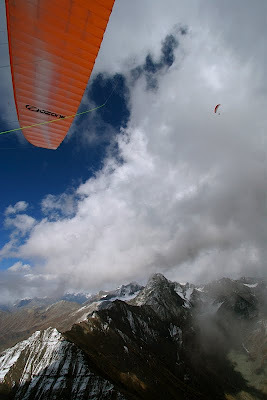 I just took a couple of climbs and glides and another col and flew out into the Kullu valley at Manali. Then I managed a simple glide to the Solang landing area in the north of the town. Scott joined me 10 minutes later and finally Tom arrived in orbit above us 30 minutes after that. We had a quick bite to eat and then endured the 6 hour jeep ride back to Bir. Scott on glide towards the big stuff. What a great flight it was with spectacular views. But it also felt a very committing flight as going down early meant a very long walk out and a long bus ride back. I'd certainly always carry the bivvy kit just in case ... The track log of the flight can be seen here. So that was my month flying in Bir. A great way to end the 2009 flying season. Hi Colin, I wondered how you was getting on and was looking forward to hearing all about it. It sounds and looked like you had an amazing time mate! Lets hope we can go on an adventure sometime in the future!!! It sounds like a great trip, Colin. Nice photos and a great description. Colin that's amazing stuff. I had butterflies just thinking about the tension of only-just-making-it to the landing. We had a talk from Jim and Eddie about their flying there so it's good to hear it from the client end too. Finally looked at your trip Colin. Great stuff! you got some amazing flights in, unusual for October to have so many 4000m+ days. Great that Eddie, John and Jim continue to make the trip happen. I went to Bir when I was pretty fresh (and it was also rather inverted) so I never made it over the back or very far. Your trip report (blurb, photos, tracklogs) is awesome! Definitely want to go back now! 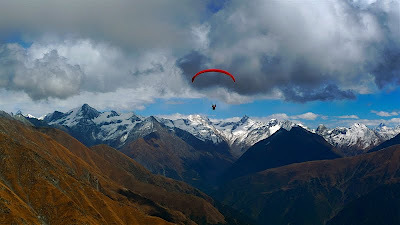 Wow that's images is really gratefully i love this by the way Enjoy refreshing paragliding and fly like a free bird leaving behind all the worries and tensions .